Vet techs and vet receptionists have challenging jobs. It takes the right skills to be able to balance catering to the pet owners and catering to the actual pets. It’s difficult because pet owners often expect professionals to swoon over their animals, and they’re even offended if they don’t. However, all that attention is not always in the best interest of the pets. It depends on the pet. Unfortunately in my experience, some receptionists in veterinarians’ offices tend to treat all dogs the same. They talk in high-pitched voices using an excited tone. They face the pet head on and bend down to their level. And they make direct eye contact, trying to pet them and hand out treats. These are all good enough responses to a fairly chill, well-behaved dog like my black Lab mix Ace, especially if the dog is comfortable around strangers and being at the vet. Ace is a dog who can handle just about anything you throw at him. He’s one of those “bomb proof” dogs. Remy is what you might imagine if you threw a rope over a coyote and drug it into a vet’s office. OK, maybe not that bad. Because he’s friendly. Boy is he friendly! We walked into the vet’s office Monday and he’s on his hind legs doing his possessed kangaroo hop as we walk through the door. Barking with excitement. Pulls so hard he flips over on the slick floor, landing on his back. I had him on a slip lead with no slack, so I kept him pinned to my side as we sat down. “Shhh. Hey!” I whispered, trying to calm him. “Oh, Remy! We want to make you love the vet!” she says. At this point Remy is trying to jump and climb over me to get to the receptionist. He grabs at me, tries to bite the leash, barks. “You don’t need to come over here,” I say again. She then stands 10 feet from us, focusing on the coffee maker. This is her way of “ignoring” Remy. He does quiet down, but he’s staring at her, trembling with anticipation. “No. Don’t come over here,” I say. I had to ask her a total of 4 times to leave us alone. Asking her to ignore us was not clear enough. I had to spell it out firmly, multiple times. All that aside, the real problem is not exactly the receptionists or the vet techs. It comes down to training and socialization. My dog is poorly behaved at the vet because he’s a hyper, overly excited, explosive young weimaraner with little impulse control. He would’ve been a handful even if every single person had ignored him until his appointment. Dogs are generally going to be at their worst behavior at the vet, so it’s not fair for me to judge Remy (or myself or the receptionist) based on anyone’s behavior that day. What matters, really, is how he handles himself in general out in public and how I respond. What can we do to improve? Visiting new indoor, public places more often. Working on sitting and just doing nothing. Places like Petco, Home Depot, etc. Continuing to ask people to ignore us. Serious exercise. Oh boy does he have energy. We need a genuine run every single day. Leashed walks and the occasional dog park trip is not enough. Training classes. Keep at’m! As we’re doing. That’s all there is to it. Patience. Patience. More practice. More practice. And pet professionals like dog walkers, groomers, boarding workers, pet sitters and dog daycare workers, you have tough jobs. I know because I’ve worked in all of those jobs. It’s a balancing act because all dog owners and dogs are different. For the dog’s sake, too. Thank you. Do any of you have any examples of how a pet professional affected your dog’s behavior for better or worse? P.S. I never knew a dog could be that excited for a neutering appointment! This is seriously made me laugh so hard. I took Willow to get her stitches out after she was fixed, it took three vet techs and myself to hold her down. She was jumping on them biting on there sleeves, it was great fun. Oh thank God it’s not just me! Haha! My female is fearful and the squeaky voice sends her into frantic clawing, poop/pee in the waiting room, and I do take her in to be weighed just so she has good and short experience but she’s 11 maybe she’ll settle down? Aww, poor girl. I should take Remy to our vet more often to get him weighed and just practice being there. But I feel like he causes a commotion! Ha. I had this problem at my previous vet office. No matter how many times I said, “she’s still in training, our rule is four feet on the floor before she gets any attention” every vet tech that walked out had to use the high pitched excited voice to talk to her. Basil is small and adorable so she gets that reaction a lot and we’re working on it. Thankfully my new vet and everyone in her office is amazing. I can’t say enough what a difference it made to find the right vet (for a variety of reasons) but helping me reinforce the training I’ve been doing really gave them a gold star in my opinion. Now that I’ve had a few days to think on this, what would probably help most is to just tell the receptionists ahead of time to please ignore Remy when we come in as it helps with his training. I have a cat who is fearful and aggressive at the vet and I always remind the staff of this ahead of time and they act accordingly. With a friendly dog like Remy, this just didn’t cross my mind to give them a “warning.” Good thing is the techs and actual vets at the office (and most of the receptionists too) are good at acting calm. I have the same problem with people approaching our dog who is very frightened about people she doesn’t know looking at her or approaching her on walks. Total mayhem! I’m a nervous, insecure dog who is just building my confidence. Please keep away from me, don’t speak to me, don’t look at me. I’M NOT REALLY HERE!!! OK!!! But she’s not a big enough dog to wear such a large banner. I worked as a vet tech for many years and never squealed or acted silly around the clients. I’m just not built that way. One of the techs was that sort of person and she greeted every dog that came through the door by shrieking their name, rushing up to them, getting in their face, talking in a baby voice, acting very silly, in my opinion. Many times she would cause a dog to pee or cower or get overexcited. 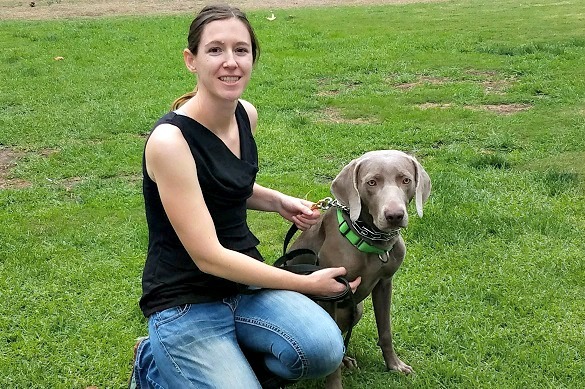 The dogs’ owners seemed to love her, no matter how their dogs were reacting, and so I always thought I was deficient, until I finally realized none of the “wrong” behavior occurred when I interacted with them. Still, many of the owners definitely preferred the other tech’s approach. I just couldn’t act that way. In my own experience with my dogs now, my vet’s staff is wonderful. Everyone who works there is calm. They just basically say hello to my dog and me from behind the counter, or calmly call the dog’s name when it’s time to go in the exam room. If I ever have to leave one of my dogs for whatever reason, they let me walk her to the back and put her in the kennel, no high pitched coaxing required. Thank goodness. I worked at a boarding facility as a receptionist and kennel worker for 8 years and I was also calm around the clients. I’m lucky because all of the pet professionals I encounter know how to handle each of my dogs. They do an amazing job – better than me in many cases. I do, however, encounter people who are excited when they see me walking 2-3-or-4 dogs and want to come over to say “hi.” I’ve learned to be firm with people because no matter how many times I politely say “no thank you” and “my dogs don’t greet on leash,” – the person counters with “that’s okay” and keeps on coming. 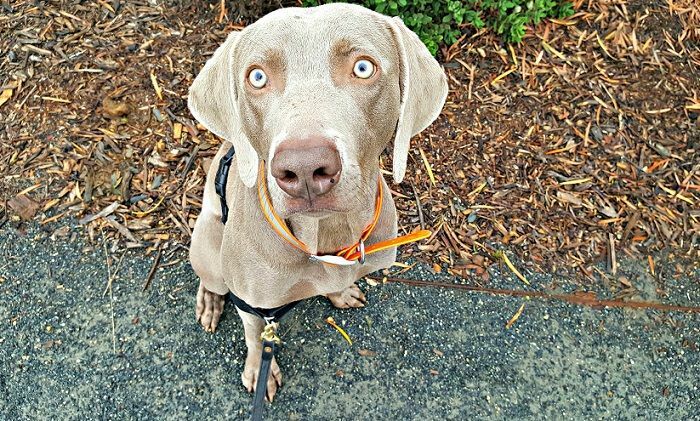 With regard to Remy, because he’s such a high-energy dog, can you walk him first to calm him down and if so, how long will those walks have to be? I ask because there was a time when we wanted a Weimaraner. I always walk him first and it doesn’t appear to make a difference. I only took him 2 miles this particular day but I would say he would need to go 6+ to possibly see any slight difference. Running off leash helps some and also taking him new places and working him mentally. But I’ll be able to start running with him further now that he’s getting older. The whole idea about a professional is that they would know how to read dogs’ body language and use that to choose their response. If the dog is wanting to interact, interact. If the dog isn’t wanting to interact, give them space. Should be simple, no? Ah, that would be confusing then. The best solution, I guess, is to warn them before hand and ask them for what you want. Archer is high energy, but not near the level of Remy. Lucky for us the vet receptionists at our office are good with him and know how to properly handle his energy level. We have more issues with the general public when they see him walking around in his service dog puppy vest. The good news is most people will comply when I tell them that I’m working on his training and to please just ignore him. However, there are some idiots that sit there and continue to distract him by making noises, clapping, whistling etc. I guess if it’s something he will encounter in real life then it’s something I need to teach him to ignore. Good point that no matter how people react to our dogs it’s our job to teach our dogs how to respond to that. I’m so thankful that there isn’t too much excitement coming from the staff where I go. I couldn’t imagine trying to keep Laika calm with 3 people talking to her in that tone while there’s 3 other dogs nearby. It’s hard enough as it is to for me to keep her composed.. Oh the vet sure is fun lol. a vet receptionist/tech can make or break me going to a vet. i am so grateful for the 2 places that i go to that they are absolutely wonderful. i had problems at the vet school, the techs are incompetent and the receptionists totally ignore the dogs. when my oldest was there for vestibular, i had to tell the vet tech to hold her head, so many times, that i complained to the vet several times. he just let her head flop. they did not even try to feed her. i had to go over everyday and hand feed her. i am paying over 3k and they did crap. Our LABRAdoodle (more lab than doodle, hence the caps) is super super friendly at almost a year old. He’s better now but still gets initially excited going to familiar places— whether it be a walk around the neighborhood, the park, dog park, the vet, groomers, etc. He does jump to greet and we understand that this is partly because of his breed. We do our best to approach him calmly, to train him (impulse control) and to discipline (2-3 min time outs, ignore) but when we are out and about, well, it is challenging. we’ve asked people to just ignore him. As most have mentioned some folks comply, and some don’t. When ignoring doesn’t work, then we “manage” with treats/ball/stick/plastic bottle (he is a lab afterall) to entice him to “sit”. And for the most part, he calms down. When we go to the vet, I typically will check in without him, go back to the car, and wait there. However, I’m thinking on our next vet visit, I’ll warn the staff that he tends to be overly friendly and excitable. Glad to know that there are other parents of excitable and super friendly pups out there. I think there are a lot of overly friendly, excitable dogs so at least it’s a common problem trying to manage their energy. I know it’s much easier than working through problems with aggression or fear, however, so I probably shouldn’t worry about it so much.